The lioli™ IOL Delivery System is a truly unique IOL delivery system that utilizes the innovative LubriMATRIX™ treatment technology specifically designed and developed to enable a safer, simpler and more effective intraocular lens (IOL) delivery. LubriMATRIX™ protects the IOL from damage during cataract surgery. The lioli™ IOL Delivery System, packaged in sets of 10, is available in a range of incision sizes (LIOLI-18, LIOLI-22, LIOLI-24). Each set contains a sterile single-use injector and a LubriMATRIX™-treated cartridge. PRECAUTION: To ensure safe and effective IOL delivery, it is essential to follow instructions carefully. Step 1 While in a sterile environment, peel back the Tyvek® lid from of the top corner(s) and remove the injector and the cartridge from the sterile blister packaging. Step 2 Apply a small amount of viscoelastic solution onto the inner channels of the cartridge and the opening tunnel (Figure 3). 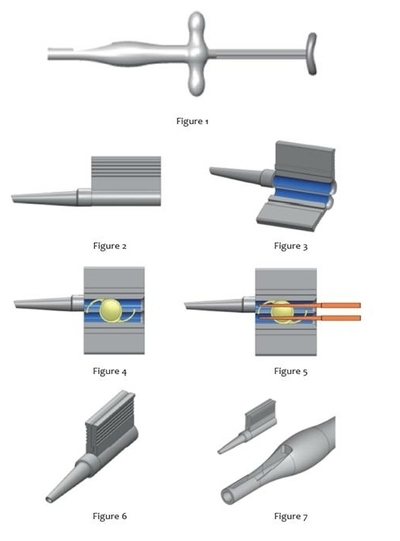 Step 3 Remove the intraocular lens from the vial using sterile rounded tweezers and position it onto the central hinge of the open cartridge (Figure 4). Align the one-piece lens parallel with the rails of the cartridge in a reverse S position for IOLs with C-loop haptics. Step 4 Press the lens into both guide rails with rounded tweezers and gently move it back and forth horizontally to ensure that the lens moves freely (Fig 5). Step 5 Carefully examine the position of the lens to make certain that it is correctly aligned and that the cartridge sides close. Be sure that neither the edge of the lens nor the haptics are wedged in. Step 6 Press the cartridge flaps together until an audible click is heard. This indicates that the cartridge is locked (Figure 6). Step 7 Retract the silicone-tipped plunger of the injector and load the cartridge into the front end of the injector. Push the cartridge into the very front position (Figure 7). Step 8 Carefully push the plunger forward to ensure that the silicone tip correctly enters the loading chamber. Continue to push the tip until the inner spring begins to press together. Pull the plunger back a few millimeters and then push it forward again. This step ensures that the lens is correctly grasped. Step 9 Advance the lens to the foremost point of the cartridge outside of the eye. The lioli™ IOL Delivery System is now properly loaded and ready for use. PRECAUTION: The lens should be injected immediately after being introduced into the cartridge as viscoelastic solution may lose its lubricating properties when exposed to air for a long period of time. WARNING: Do not use the lioli™ IOL Delivery System with three-piece foldable intraocular lenses. This is an ethylene oxide-sterilized device not intended for re-sterilization/preparation of injector or cartridge. Single-use only. Reuse could result in device contamination or damage to IOL or cartridge. Do not use if package has been previously opened or damaged.